So it started as a joke, with one of the youth moms. We were talking about an article in the New York Times, and about giving something up for Lent. I said "I'm so addicted to Facebook, I should give it up." After we stopped laughing, I began to seriously consider this as a challenge. Could I "fast" from Facebook? Since I use Facebook for work, as a communication tool, I didn’t think I could realistically give it up for the entire time period. That’s when the idea of a Facebook Friday Fast began to form. Honestly, I’m not just rationalizing away a 40-plus day fast. I just don’t use Facebook recreationally. it's a major way I stay connected to people because of my job. Some people use Facebook more than e-mail. I also thought asking teenage girls to give up Facebook for 40 days (to be exact, 46 days ending on Easter Eve when you include Sundays into the count. ), would be an unrealistic challenge, and potentially set them up for failure. I wanted them to find success in this effort, since many are still new to the idea of fasting. Giving up Facebook for them, isn't like giving up soda or TV - it's a major form of communication for parents, teachers, schools, student groups, etc. Yes, while they use it to "poke" or "stalk" (in fun) their friends, they also use it to plan activities or stay in contact with people beyond the phone or e-mail. Who knows, maybe we’ll all find out that we don't have to be tethered to the virtual world 24-7-365. Besides, I opened my mouth to the wrong person (insert laugh) and ended up being interviewed for a faith feature for the Arkansas Democrat Gazette about this "venture" in fasting from social media. So now, in an effort to "put my money where my mouth is," I'm a bit committed to this idea. The journalist asked me why fast at all. Honestly, I'm still formulating my answer to that question. I'm not doing it out of a legalistic viewpoint, but instead, using it as a way to eliminate one distraction, for at least 41 hours each week (yes, I did the math - it's almost a Biblical amount of time). Hopefully, it will help diminish the "hold" Facebook has in my world, as well as give me additional time on Friday, to "unplug" from the computer. I hope this fast cuts down on the amount of time I spend on Facebook during my "downtime." I know, I can waste a lot of time being on the computer, because a quick check of Facebook and e-mail can lead to a couple of hours on-line. Who knows, maybe I’ll find that I can disconnect from Facebook and the Internet for more than one day. Anyway, here's the plan - hastily put into motion with one of my teenage cohorts. If you want to join us, let me know. It will be interesting to see how this works. The fast will start at 9 p.m. on Thursday and continue through 9 a.m. Saturday morning. 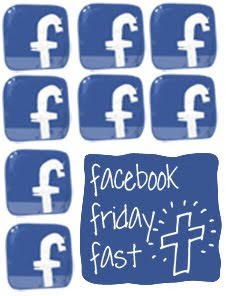 We will each assign someone who has password control of our Facebook during Lent. They agree to "log us off" at 9 p.m. each Thursday evening, by changing our password. On Saturday morning, they'll provide us with the week's password, so we can log back in again. If we receive an e-mail notification from Facebook during this time period, then we'll ignore it and leave it unread until after 9 a.m. on Saturday. Pray. Journal. Go for a walk. CALL a friend and TALK to them. Write a letter to someone important. Do anything but “stalk” your friends or “poke” them on Facebook.We might even get together for a Facebook Fast support outing on a Friday night. Note: This is the article, passed on to me by Brandy Roebuck, is what started the entire discussion. Sounds hard lol. I'm in!